Hi, I am Erik. Your conscious chef! For me nothing is more satisfying than giving my qualities and passion in the food I prepare. It’s not only about the food and its ingredients, it’s my presence and devotion that makes the difference. How I cook is how I live my life: straight from the heart. Health, consciousness and taste are the three values I honor when creating meals. Working as a chef in the energy of a group, using high quality produce is a privilege and that will make you enjoy my creations! 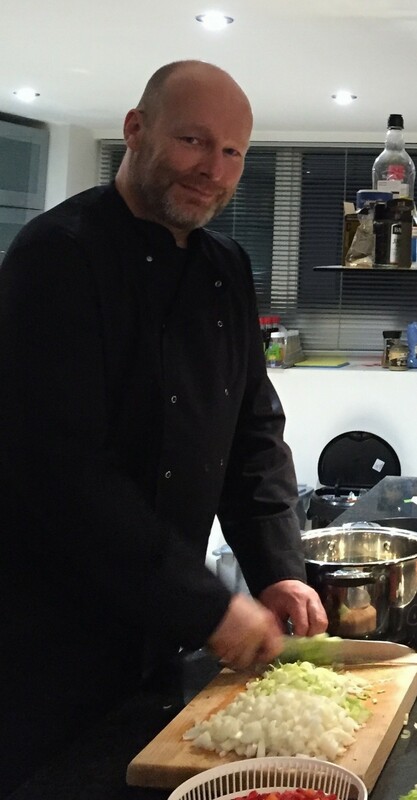 Alongside cooking I also help people (mainly men) finding their next step in life through deep integral coaching. I help you to dream, to find your life vision and higher purpose and to determine the steps towards that vision (see younicus.nl). Creation of food as well as helping to find dreams and vision has lots of similarities, that’s why it is so beautiful to combine. It’s both a huge contribution to one’s joy and quality of life! I facilitate groups varying from 15 to 250 people. People that perform work on themselves have different needs every day and I will provide in those needs. Tuned in tho the energy of the group, I will be able to serve exactly what you need. When creating the meals I channel my own energy and the energy of the group. Cooking is meditation for me. Fully devoted, always present and in full connection with the food and to people around me, the most delicious creations emerge. My focus is working from the heart. I do not produce food, I create nourishment. I play with flavors, I compose meals using color, scent and taste. Enjoying my creations is like enjoying art. Take your time, look, feel and taste. I cook worldwide dishes from Morocco, India, Indonisia, Thailand, Mexico, Italy, Russia, South America, South Africa and more; Vegan, vegeterian or non vegeterian.